« Quick Reminder! Classic Reads Book Club! Yay! A weekend at home! The last two weekends we’ve been out of town, first in Indianapolis, then in Cincinnati. Although it was fun, I’m quite relieved to actually be at home this weekend (and NOT have a 4-6 hour car drive with a one year old). We’ve been mostly taking it easy this weekend, yesterday I had a massage and took advantage of Illinois’ first ever(?) tax free week. Today is going to be relaxing too (as relaxing as things get with a young toddler). We’re headed down to the lake for some fun in the sun. We’ll be there with all four of Daniel’s grandparents, plus his uncle, so there may just be enough people to watch him that I’ll be able to get a little reading in. I really needed this relaxation, because this has been a busy week here! 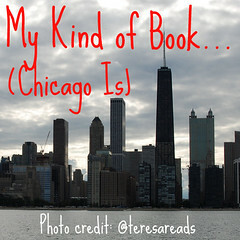 Last Sunday I announced my feature for the month of October: My Kind of Book, a Celebration of Chicago Authors. 10 comments to TSS: Ahh, Relaxation. I know what you mean – traveling is so much fun, but it’s wonderful to be home too! Let the grandparents enjoy Daniel and sit back and relax. It looks like you have a great day of relaxation planned! Before I moved to Denver a couple of years ago I lived in Indy for over 20 years. Did you do anything fun there?? I grew up in Indy. Now we are in the Dallas area. Hard to get used to being very hot all summer long. I do love Indy, and I love to travel, but there is usually hell to pay once I get home. You have had a very busy week, on and off the blog. Have a great day of relaxation today! It sounds like you’ll have fun at the lake. I love when I get to sit out in the sun and read. Hope you have another great week of reading! I love relaxing weekends. I had three in a row that were crazy busy and now this one was “ahhhhhh perfect” here too. I look forward to seeing your new feature in the near future. That sounds great, and I’ve actually heard of this Teresareads, imagine that ;). Relaxing weekends are the best! After having my mom stay with me for the past five weekend I know exactly what you mean about need to have a weekend with some R & R! I’m hope you were able to get some.